We weren’t expecting the New York Mets to make many moves in the offseason, but they brought in Robinson Cano and Wilson Ramos. Injuries have always derailed the plans for the Mets, but with a healthy lineup coming into the year, there is some excitement. Michael Conforto and Brandon Nimmo are the outfield options New York has decided to build around this year. When healthy, Conforto is an excellent left-handed bat. Both have subpar strikeout rates, but who doesn’t these days. Cano is over the age of 35, coming off a PED suspension. He still can bring some value to the Mets, and the same goes for Jed Lowrie who they also brought in this offseason. They are looking to compete with older names, and it just might pan out with their rotation being as strong as it is. Having the reigning Cy Young winner starting your rotation is never a bad way to head into the season. Jacob deGrom is coming off a fantastic season where he posted a 1.70 ERA. He had 269 strikeouts in 217 innings, and yes we know he won just ten games. deGrom was easily the best pitcher in baseball last season, and the upside heading into 2019 is there again. As long as the health is there for deGrom, he should push 200 innings and be well over a strikeout per inning. With a better offense and bullpen, deGrom might actually get some wins which people seem to care about. He will be a Cy Young candidate, and this just kicks off the rotation. Noah Syndergaard had a 3.03 ERA this past season, and averaged a strikeout per inning. He pitched better than advertised, and of course this season he should boast better overall numbers. Thor is projected to have better strikeout stuff, and a lower ERA this season. There were some talks that they could trade Thor in the offseason, but after coming to their senses, he will still be in New York. Zack Wheeler has dealt with injuries early in his career, but 2018 was his breakout year. Wheeler threw 182 innings, which was his highest from 2014. He had a 24% strikeout rate, and a 3.81 xFIP. Wheeler putting up these type of numbers makes this lineup go from good to great. Wheeler has all the talent in the world, and we might now be in the beginning stages of a longer sample size for him. 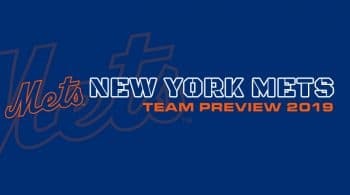 With the offseason moves, and the emergence of Wheeler, there is a chance the Mets can make a run. Steven Matz had a decent run last season, boasting a 3.97 ERA, and averaging about a strikeout per inning. Matz has had an up and down career, and it will be interesting to see if he can build upon a pretty good 2018 season. He is another reason for the Mets to believe in a postseason run. If Matz can deliver as a fourth starter, this rotation could possibly jump up into top three contention. New York has names like Jason Vargas, Seth Lugo, and Hector Santiago all battling out for the fifth spot, but Vargas is likely the name that comes out of it.